The ongoing volcanic eruption occurring within the Leilani Estates neighborhood on the Big Island of Hawaii has received national media coverage, generating much excitement and speculation. Human casualties have been successfully avoided as residents have evacuated from their homes. But the eruptions show no sign of stopping in the short term, and all of the fascinating video footage deserves a bit of scientific background. KILAUEA, ONE OF THE FOUR ACTIVE VOLCANOES ON HAWAII, IS RESPONSIBLE FOR THE CURRENT ERUPTIONS. However, volcanic eruptions have been commonplace on Hawaii for as long as humans have inhabited the island. Kilauea (and the rest of the Hawaiian islands) were formed by a unique geologic feature called the Hawaiian hotspot. This hotspot is a vertical plume of superheated rock that extends 1,200 miles beneath Earth’s surface down to the lower mantle. Kilauea, which is situated directly above the hotspot, has been continually erupting since 1983. For the past 85 million years, the hotspot has been melting the Pacific plate and producing volcanoes as the plate moves westward at a rate of 7cm per year. This slow process has created a 3,600 mile-long chain of extinct volcanoes called the Hawaiian/Emperor seamount chain, which extends across the seafloor from Eastern Siberia to present-day Hawaii. The hard, outer shell of volcanoes are formed by lava and ash that has cooled and settled at the surface. The intensely hot interior contains pockets of liquid magma, water, and steam, which travel through a complex, ever-changing system of interconnected cracks and joints. The system of subterranean magma chambers is highly unpredictable. As various crack systems cool and become sealed, heat and pressure builds underground until new cracks – or fissures – emerge at the surface, allowing the heat and pressure to be released as magma flows to the surface. Magma can also consolidate into large subterranean chambers that overflow onto the surface. The “lava lake” visible main crater at the summit of Kilauea Volcano in Hawaii Volcanoes National Park is one example of this spectacular phenomenon. Today, neighborhoods and forests on the eastern flanks of Kilauea are being destroyed as fissures and active vents release lava and sulphur dioxide gas. The reddish-black lava accumulated in piles up to 40 feet tall and 150 feet long, and the US Geological Survey has reported lava erupting 100 feet into the air. While the landmass of the Big Island is growing as a result of the ongoing eruptions, the overall size (or surface area) of Earth remains the same; this is the magic of plate tectonics. Volcanic and tectonic activity causes Earth’s surface to move, stretch, and grow in various regions, while the crust is simultaneously consumed somewhere else. Earth’s crust is like a conveyor belt: heat from the interior escapes at the surface, releasing lava from fissures and rifts at the surface. As the lava it cools and hardens into oceanic rocks and sinks beneath the continents only to be remelted, forming continental volcanoes which, in turn, produce more lava and help the continents expand in size. 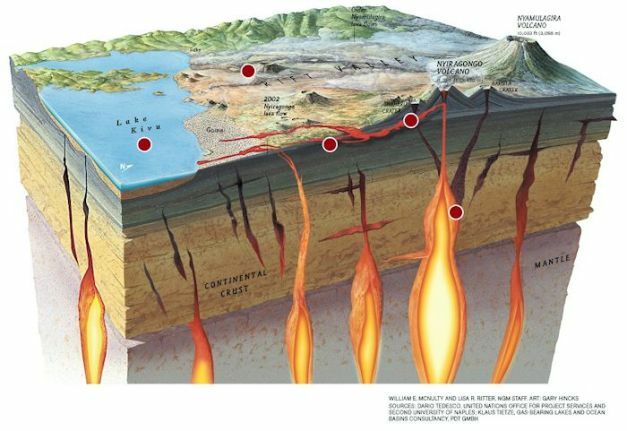 AS THE OUTER EDGE OF THE PACIFIC PLATE DESCENDS BACK INTO THE MANTLE, THE RISING MAGMA PRODUCES A MASSIVE STRING OF VOLCANOES KNOWN AS THE RING OF FIRE. THIS EXTENSIVE VOLCANIC REGION COMPRISES THE PACIFIC COASTS OF INDONESIA, ASIA, AND THE AMERICAS WHERE 75% OF ALL ACTIVE VOLCANOES AND 90% OF ALL EARTHQUAKES OCCUR. Native Hawaiian names describe the two main types of lava flows, and American Geologists have adopted these names into use. Pahoehoe (pronounced 'paw-hoey-hoey") is a fast flowing lava with a smooth, billowy or ropy surface. The Aa lava (pronounced "ah-ah") cools into broken blocks and chunks. The texture of the two lavas are different, but they are both made of the same composition of extremely hot magma called basalt, which generally has a very low viscosity and flows easily. THE DESTRUCTIVE PHASE OF THE ERUPTION IS IMMEDIATELY FOLLOWED BY THE TRANSFORMATION OF LAVA ROCK INTO SOIL - A POSITIVE FEEDBACK LOOP WHERE THE ATMOSPHERE AND PLANTS WORK TOGETHER TO CREATE SOIL. The process of making soil from solid rock takes tens to thousands of years, depending on the rate of weathering in the region. At lower elevations on the island of Hawaii, warm temperatures and high amounts of rain help to quickly break down the volcanic rocks, and organic acids produced by plants help to continue the process. Since 1790, three lava flows have occurred in the Leilani Estates area, although the most recent eruption was in 1955 before the neighborhood was built. For the past several decades, the Kilauea lava flows have occurred primarily in Kalapana, an area located 10 miles southwest of Leilani Estates. In 1990, the neighborhood of Kalapana Gardens was buried beneath 60 feet of lava. Despite this volatile history, residents continue to build homes throughout the areas most likely to be affected by eruptions. Although four of Hawaii’s five volcanoes are technically still active, eruptions have not occurred on most of the island for 200 years or longer. In hopes of rebuilding, there are many safer options for locals who wish to remain on the island. The fissures opening and releasing lava is part of the natural geology in Hawaii, and it is the one reason that the islands exist at all. The unique, local landscape is evidence of a much bigger and complex system that allows scientists, residents and visitors to witness both a dangerous and fascinating phenomenon. John Russell is a geologist based in Atlanta, GA, and holds a Master’s degree in Geoscience. He currently works on federal environmental restoration sites across the country in order to remediate soil and groundwater contamination according to EPA standards. John enjoys hiking, climbing and exploring new cooking techniques.